Spencer: Last weekend my grandmother was sent to the hospital. Thankfully she’s recovering nicely, but the actual task of getting her treated was complicated by the sheer amount of her children and grandchildren gathered in one place, bickering over treatments, supposedly-rude doctors, and the usual family gossip. For better or for worse, I think this kind of behavior is typical when almost any family gets together; there’s no task so important that some family drama can’t derail it. That’s certainly the case for the Odinson clan in Thor 3, who nearly bicker each other into oblivion even as the Queen of Cinders is on the verge of conquering Hel. Of course, family drama isn’t confined to us mere mortals — it’s a trademark of almost every kind of myth and story there is, even the tales of great deities. The big difference between, say, Greek or Roman myth and the squabbles of the Odinsons is that Jason Aaron and Mike Del Mundo revel in how silly and petty the whole thing is. 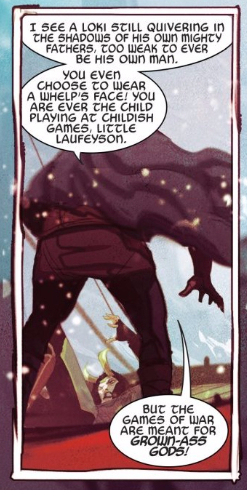 Much of that comes down to Del Mundo’s art, which finds the humor in every scene, be it Tyr’s scraggly, mangled mustache, the multi-colored stars that fly when punches connect, spiders flying out of Thori’s fur when he scratches, or the “Just Married” monster truck awaiting Hela and Balder. Even the action sequences are filled with brightly colored monsters and absurd character designs that are not only a ton of fun on their own, but a wonderful reminder to not take things as seriously as the Odinsons are. That’s not to say that they aren’t facing serious threats in Thor 3. 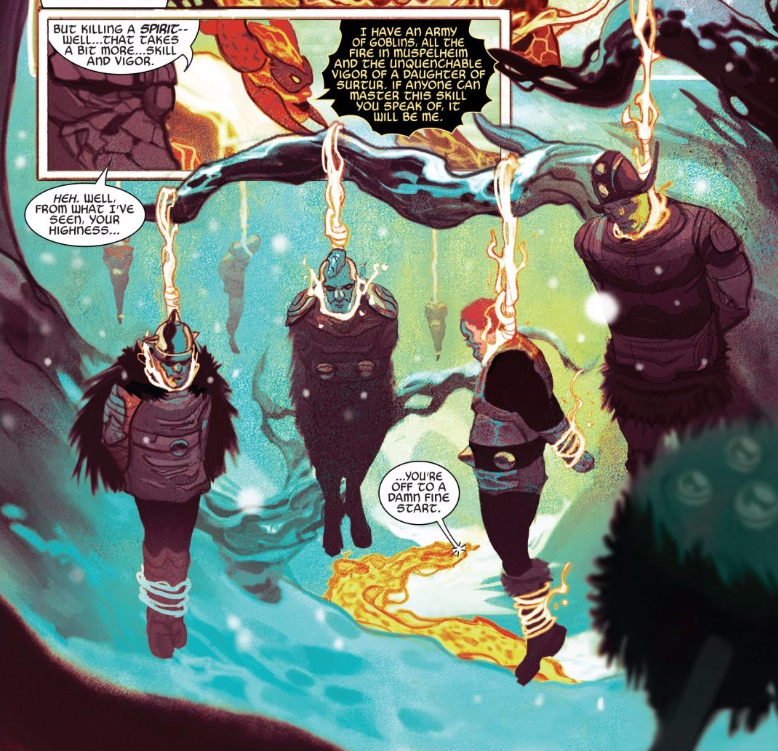 Sindr and her allies in Malekith’s army threaten all of the Ten Realms, and the question of whether Hela or Balder should rule Hel is a legitimate one, just poorly timed and even more poorly argued. I get the feeling that neither ruler would back down under even the best of circumstances, but the fact that both sides of the conflict involve family makes a resolution even less likely. It’s impossible to discuss diplomacy when you’re too busy rehashing childhood grudges. 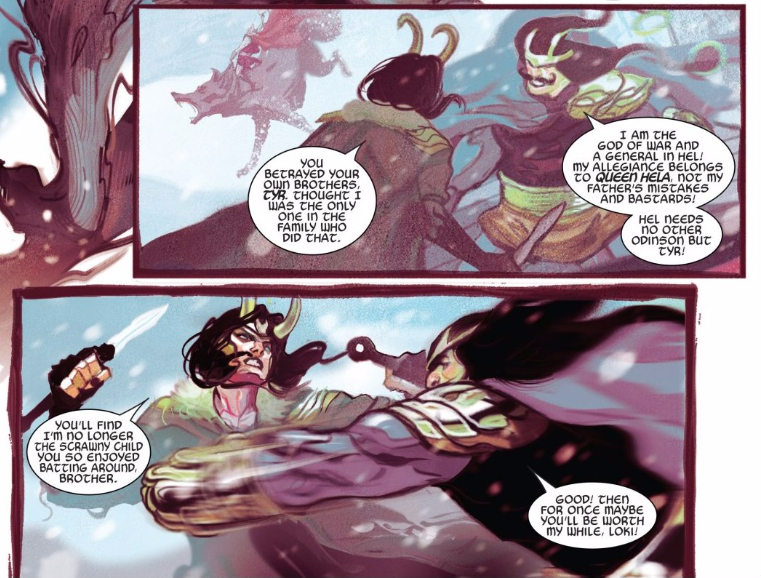 This is easily the best observed moment of the issue, as neither Tyr nor Loki can see each other as the adults that they are. Instead, like far too many sibling relationships, they’re still wrapped up in their (dysfunctional) childhood dynamic — and just as children are lackluster at resolving conflict, so are these two. The arrival of Thanos as Hela’s apparent husband/betrothed throws an interesting monkey wrench into things, but I don’t think he’s going to be the voice of reason we might expect from someone outside the family — instead, it seems more likely that he’ll be that one partner/spouse who joins the family and is immediately waist-deep in drama, just like the rest. Instead, it’s Thor who keeps a clear head throughout the issue. Seeing the Odinsons embroiled in such petty squabbling gives a bad names to gods, and indeed, Thor once again laments how unworthy the lot of them are. But he’s not only able to push that thought aside and free himself from a literal river of despair, he’s also able to see past the present conflict and to the bigger picture. He knows they need, not the minions of Hel, but the warriors of Valhalla to defeat Sindr and Malekith, and his plan to get them is incredibly reckless, but also perhaps the most mature decision of the issue. For as unreliable and petty, as conniving and treacherous as Loki can be, Thor still loves him, and that allows him to look past family drama, make peace, and get things done in a way nobody else in this issue can. That makes him pretty worthy in my book. (On a totally unrelated note, Thor 3 could also be read as an interesting bit of political commentary. The Odinsons could easily represent the Democrats and the rest of the “left,” tearing each other to shreds over minor idealogical differences while the real enemy, Sindr’s army — a.k.a. the “right” — demolishes everything in sight unopposed. Thori, who starts yelling and arguing just because everyone else is doing it, making noise but no real point, certainly resembles just about every politically inclined troll out there on the internet. And it seems like no coincidence that the biggest atrocity we see Sindr commit is one with ghastly real-world implications. Lynching is a hate crime with a deeply racist history, so it seems like no coincidence that it’s being perpetrated by an army with similarities to modern Republicans, a group not only barely trying to hide its racism anymore, but which has been inciting a rapidly growing rate of hate crimes over the past few years. The fact that the guest list is necessarily made up of the dead allows Del Mundo to flex on some great Día de Muertos skeleton designs, but my absolute favorite detail is the bowtie on that horned, hirsute character in the bottom left corner. They may be in Hel, but this is a formal occasion! That political read feels like a bit of a stretch to me, but mostly because the ultimate strategy here seems to be “the enemy of my enemy is my friend.” The goal here is to unite Hela and Balder’s forces against Sindr, and the implication of that ending suggests that the gang might be teaming up with Thanos to that same end. The thought of a larger enemy uniting unlikely allies abounds in comics (most notably forming the crux of Ozymandias’ plan in Watchmen), but feels almost impossible in this modern political climate. Maybe I’m too much of a pessimist, but I’ve seen enough comments (possibly from Russian bots, admittedly) thanking Russia for helping to elect Trump to think nobody even recognizes the “larger enemy” anymore. Fortunately, the Odinsons have more character and perspective to recognize that Sindr is obviously the bigger threat. They may still squabble over the throne of Hel, but that squabbling is moot if someone outside the family is sitting on it. It’s why Balder (and apparently Hela) agrees to Loki’s plan, and it’s also why Thor is willing to die to alert the fallen warriors in Valhalla. They all recognize that their shared interests are more important than their differences, and may require some sacrifices on their parts. For some, those “shared interests” are little more than “power,” but Thor hints at something deeper in that sequence Spencer included. “Blood is thicker than water” might be too pat a way of putting it, but there’s something more than a coincidence of self-interests bonding these characters. 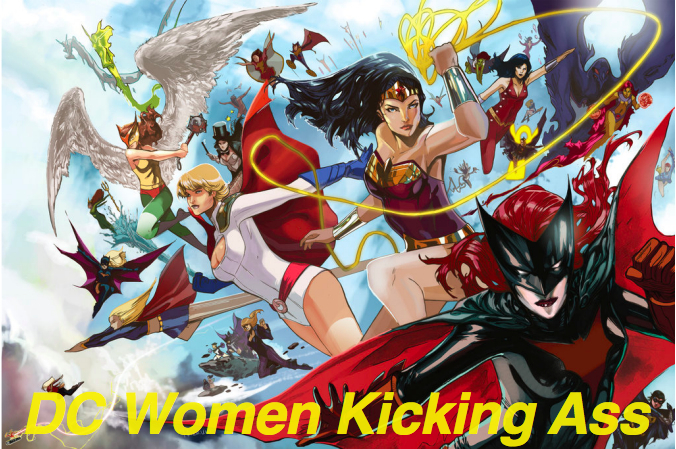 And that might just be my favorite thing about this issue. The bickering is fun when everyone is fighting, but it’s downright endearing when they’re trying to be on the same side. Maybe it’s because it feels more like the subtle barbs and catty remarks you might see at an actual family gathering (you know, where swinging axes at one another is frowned upon), but I can’t get enough of watching these characters threaten and cajole one another in spite of their best efforts. Or maybe I just wanted to show off more of those bonkers character designs. Can you really blame me? The point is, Aaron and Del Mundo have assembled a team with a unique dynamic that I really can’t get enough of. I have my theories about how adding Thanos to the mix will change things, but the real fun will be in seeing how this creative team handles it. The Odinsons might not be on the same page, but Aaron and Del Mundo definitely are. Drew, I don’t think what you said in any way invalidates Spencer’s (fascinating) political read. Since Spencer identified Sindr’s army as Republicans, the people praising Russian interference would be, in this analogy, part of SIndr’s army (and praising the interference of Maliketh). I don’t think I’ve seen anyone on the Left thank Russia for electing Trump. The closest you get would be Accelerationists, who don’t praise Russia but approve of Trump’s victory because they think such a disaster is exactly what is needed to unite the world, or those that think Russia is merely a distraction from real issues. But everyone on the Left understands that the Republicans are the greater enemy, even if some have truly weird strategies of dealing with it. Which fits Spencer’s read (and the inevitable moment where the Odinson family unite and fight of Sindr would fit how, despite all the argument and debates, Democrats at large are uniting to achieve great victories in Special Elections). It is kind of hard to know what more to add to what you guys have said, both in praising the wonderful family dynamics and of the fantastic art (and all praise to Del Mundo’s wonderful monsters, but Drew, the best background figure is Karnilla, who could not look less enthused at seeing the love of her life marching down the aisle to marry Hela). Except to emphasise Spencer’s point about Thor, the only sane man, lamenting how unworthy they are. Which is, I think, the heart of this issue. 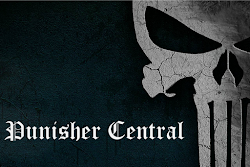 After Thor’s struggles with Unworthiness, I think this is central. Thor has matured by internalising this idea, and the heart of this issue isn’t that the family squabbles, but for the first time Thor is truly understanding the dysfunction and is now having to learn what it means to accept this fact and act to overcome it. 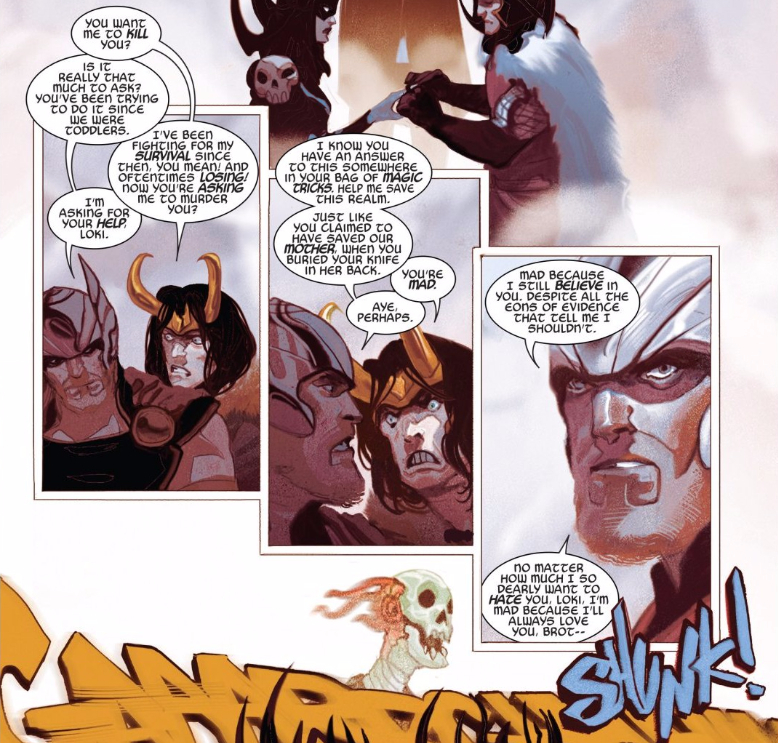 Leading to his wonderfully insane plan with Loki that, most notably, is built on the one thing no one else in the family is willing to do to another person. Trust, reach out and work together, instead of squabbling and arguing. And I do have one major structural issue. The damn flashforward. I think jumping straight to the wedding hurt this issue a lot, screwing the tension of the beginning. The conflicts as Hela and Baldur argue is rendered toothless by the knowledge that we know where it will go. Would be nice to have a little more tension about what exactly was going to happen before Loki reveals his plan. And it would make the reveal of the absurd wedding even funnier to have it as the punchline to ‘Now… hear me out before you say nah’.